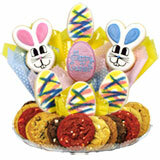 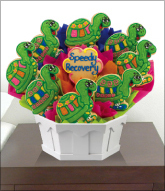 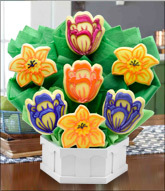 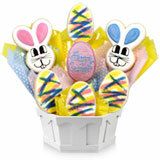 This year, warm their hearts with an Easter cookie basket! 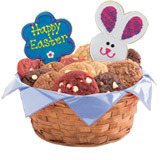 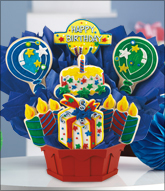 Filled with an assortment of delectable gourmet cookies and topped with one or two decorated sugar cookies including a message cookie and a bunny cookie. 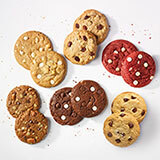 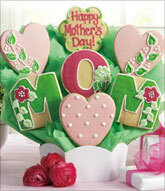 The metallic pink message cookie is “eggstra-special” in wishing your loved ones a Happy Easter! 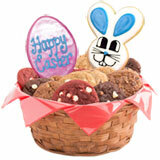 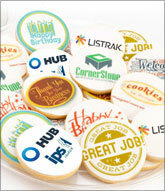 Our Easter cookies are baked fresh and hand-decorated at each location.